I came across Sawdust which is a London-based design studio formed in 2006, in a design blog, The Strange Attractor. They claim to have an unique blend of styles that have allowed them to produce award-winning work for a wide variety of clients from industries including music and fashion. Their clients are widely well-known, including BMW, Saatchi & Saatchi and Vodafone. I think their work is really worth the time spent to admire it. "Sawdust contributes to the new Daydream magazine which features artwork from across the UK, Singapore, Lebanon, Israel, Australia, Italy, Spain, Holland, USA and beyond. Launched at M&C Saatchi with a groundbreaking exhibition, the network has been making steady progress to becoming the user generated print media. The brief was 'left or right' We decided on a typographic route based on a set of words that read the same in either direction (left or right) otherwise known as a palindrome." "A global poster campaign for MasterCard which was displayed in Airports across the globe including New York, Tokyo, Sydney, Sao Paulo, Paris, Madrid, Berlin and London." "Cover designs and packaging for BMW Audio Books showcasing the work of some of the finest contemporary writing talent around. In conjunction with Random House. Featured in Digit Magazine and The Times centre spread, Business section." 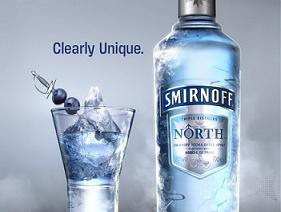 I was looking at the Smirnoff website (looking for my favourite, Smirnoff North, actually) when I came across this advertisement, which I thought was interesting and well rendered in terms of animation. The website looks quite good, and it would have been better if it wasn’t so incomplete. There are barely any complete parts of the website, that does actually include text where it should be.